Details of draw on Sunday 29 January at 13.00 hrs CET. The results at EHF EURO 2012 in Serbia mean that the final matches are known for the 2013 Men's World Championship in Spain (11 to 27 January 2013) – Qualification Europe: Play-Off Matches. Five European teams have already qualified for the final tournament; France (defending champions), Spain (hosts), and Croatia, Denmark and Serbia (as the remaining three best ranked teams from EHF EURO 2012 – as Spain are hosts). The remaining European places (9) for the final 2013 World Championship tournament in Spain will be decided in these play-off matches. The European teams qualified for the play-offs are; Czech Republic, Germany, Hungary, Iceland, FYR Macedonia, Norway, Poland, Russia, Slovenia, Slovakia and Sweden. 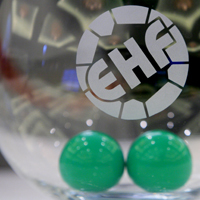 Please note that there will be a live ticker of the draw as it takes place on www.eurohandball.com. 2 balls of pot 2 are drawn to pot 1 and two balls of pot 2 are drawn to Pot 3 (the balls will not be opened). One team of pot 1 is drawn against one team of pot 3 (9 times). For each pairing the home and away right will be drawn. The winners of the play-off matches will qualify for the 2013 Men’s World Championship in Spain (IHF event) from 13 to 27 January 2013.